Whilst Royal Caribbean International has been talking about the sea since it hired JWT New York as its new lead advertising agency last year, Norwegian Cruise Line will actually be doing something about it with the first of two new ships it is building at Meyer Werft in Germany. The Norwegian Breakaway will introduce a new design that will not only bring back outside promenade decks but also allow passengers to drink and dine in plain view of the sea, as opposed to being closeted away inside the ship. Elswehere, UK cruise statistics for 2011 showed a 15% rise in the number of cruisers sailing from British ports, while on the tail of this several cruise lines have announced new ships to sail from the UK in 2013. But UK fly/cruise numbers fell by about 2.2%. To the Caribbean, a destination that has been hit hard by higher UK airport departure taxes, numbers actually fell 13%. We also look at incoming cruise numbers in two of Europe’s most important markets, Italy and Spain. But the gist of it is that the line has finally realized that people go on a cruise because they like to be at sea. 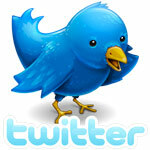 So far, this is good public relations. But last week, at Cruise Shipping Miami, came the next step when Norwegian Cruise Line announced that its next ship, the 4,000-passenger Norwegian Breakaway, will introduce a significant new design innovation: a quarter-mile-long, ocean-facing boardwalk that will be lined with restaurants, bars and shops. The Waterfront, as it will be called, will span both sides of the ship and feature eight outdoor dining and lounging options, including a steakhouse, Italian eatery, seafood restaurant, cocktail bar and a beer and whiskey bar. The new 678 Ocean Place will tie into the outdoor Waterfront on deck 8. Restaurants on this deck, including Cagney’s Steakhouse and the Italian La Cucina, will offer both inside and outside seating, with views overlooking the sea. Aso will the Brazilian steakhouse Moderno Churrascaria and a new seafood restaurant to be called Ocean Blu, which will have a raw bar and a separate sushi bar. Also on this deck, with both indoor and outdoor seating, will be Shaker’s Cocktail Bar and Malting’s Beer & Whiskey Bar. The Waterfront also will introduce a new outdoor gelato bar and a yet-to-be-revealed entertainment venue. While several lines have added outdoor seating to shipboard restaurants, the placement of so much seating along the sides of the ship facing the sea is novel. While the Waterfront area is partly exposed to the elements, designers have determined that it should not be particularly windy even when the ship is sailing at cruising speed. Other outlets planned for 678 Ocean Place include the Manhattan Room restaurant with dance floor overlooking the stern of the ship and a Shanghai’s Noodle Bar, both adapted from the Norwegian Epic of 2010. The twenty-four-hour O’Sheehan’s Neighborhood Bar & Grill, adapted from the bar of the same name on Norwegian Epic, will also feature on Norwegian Breakaway, as will a Bliss Ultra Lounge. 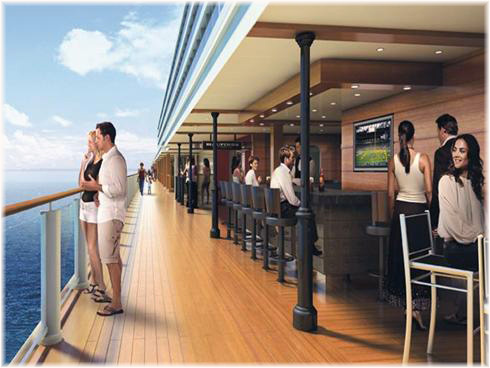 She will also have a Teppanyaki restaurant and a French Bistro, as do other ships in the fleet. The concept of opening out to the sea is very much to be welcomed after a decade and a half of cruise ships becoming more and more interior-facing, so much so that many interior windowed and balconied cabins now face onto inside decks. This trend originated in 1990-91 with the Helsinki-Stockholm night ferries Silja Serenade and Silja Symphony. Several years later, in 1998, it was partly adapted in a cruise ship in Superstar Leo, now sailing as Norwegian Spirit, with its “inside outside” cabins. With their midship internal promenades, Royal Caribbean International’s Voyager and Freedom class ships fully adapted the Silja concept between 1999 and 2008. This culminated in the Allure and Oasis of the Seas in 2009-10. Now, although it sounds like it might cost money to sit with a view of the sea, perhaps cruise ship design will evolve so that people will once again be more aware of the sea around them. A record number of Britons is now taking cruises from the UK, with the 2011 figure of 753,000 marking a 15% increase in ocean cruise passengers sailing from British ports. Information recently released by the Passenger Shipping Association revealed that a record 1.7 million Brits took ocean cruises last year, of whom nearly 700,000, or 40%, were first-timers. But the real news was that the number cruising from the UK rose by 100,000, or 15.5%. The number of fly/cruises, however, diminished, down from 969,000 to 947,000, as the UK government continues to increase airport departure taxes. Caribbean fly/cruises in particular were down 13%. As well as traditional UK lines such as P&O, Cunard and Fred.Olsen, joined in more recent years by Cruise & Maritime Voyages and the All Leisure brands, Royal Caribbean, Celebrity and Carnival will all be upping their offerings from UK ports, as will Princess to a lesser degree. Last week came the latest news, from Royal Caribbean International, who in late January appointed JWT London as its own advertising agency, a first for Royal Caribbean UK, where the public relations budget is now thought to be about £6 million. The latest news is that the 3,114-passenger Adventure of the Seas will debut from Southampton in the summer of 2013, there joining the 3,634-berth Independence of the Seas, which will be back for her fifth season. 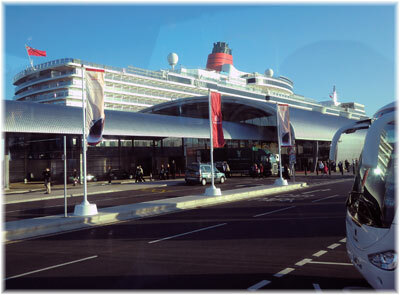 Both vessels feature an interior promenade, skating rink and rock climbing walls and many shops and restaurants. Sister line Celebrity Cruises has already announced that it would be basing the Celebrity Infinity in Harwich in 2013, giving Celebrity two ships sailing from UK ports. Celebrity Eclipse will sail from Southampton for her fourth consecutive season in 2013. Carnival Cruise Lines has also announced that it will base Carnival Legend in Dover for the summer of 2013, marking the first time they have had a ship in the UK since 2008. This follows the line’s earlier decision to send the Carnival Spirit to be based in Australia. Princess Cruises will meanwhile send the 3,076-berth Crown Princess to Southampton for the 2013 summer season to replace the 2,600-berth Grand Princess, which is going to Alaska. Princess has also announced two mini-cruises from Southampton on the new 3,600-passenger Royal Princess next year, before the ship makes her official maiden voyage from Southampton to Barcelona on June 16, 2013. 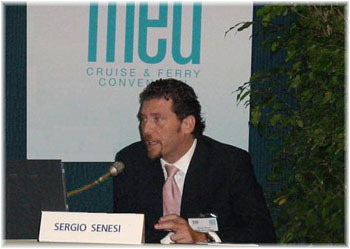 Despite the Costa Concordia incident and present economic woes, Italy remains one of Europe’s favorite cruise destinations, according to Sergio Senesi, president of the Cemar Agency Network in Genoa who spoke at the Cruise Shipping Miami last week. 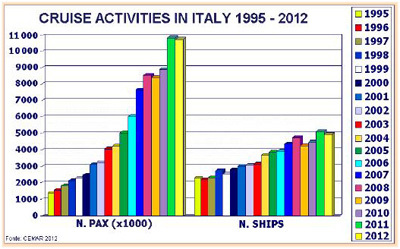 Projections indicate that 2012 will end with 10.75 million passengers having visited Italian ports on 4,891 vessels. The number of passengers are projected to be about the same but the number of ships will be down by about 5.6% compared to 2011. Following the introduction of larger ships, the average number of passengers per ship year-on-year is projected to rise from 2,090 in 2011 to 2,198 in 2012. While the number of passengers is projected to remain steady, on top of 17% growth in 2011 this is still a good result. Meanwhile, the number of cruise passengers sailing into Spain reached a record high last year with an 11.8% increase in total arrivals at Spanish ports. G P Wild estimates revealed that up to 7.99 million passengers arrived into Spanish ports last year, making up 21.4% of all visitors to Europe by ship in 2011. Again emphasizing the use of larger cruise ships there was a slightly lower increase in the number ship calls, up by 7.73% compared to 2010. Of Spanish port destinations, Barcelona continued to be most popular amongst European cruisers with 2.6 million visiting the port followed by Palma and Malaga with 1.6 million and 638,000 passengers. Spanish Atlantic ports welcomed 22% more cruisers last year with more than 884,000 while the Canary Islands grew by 15%. Previous story Monarch to Pullmantur?